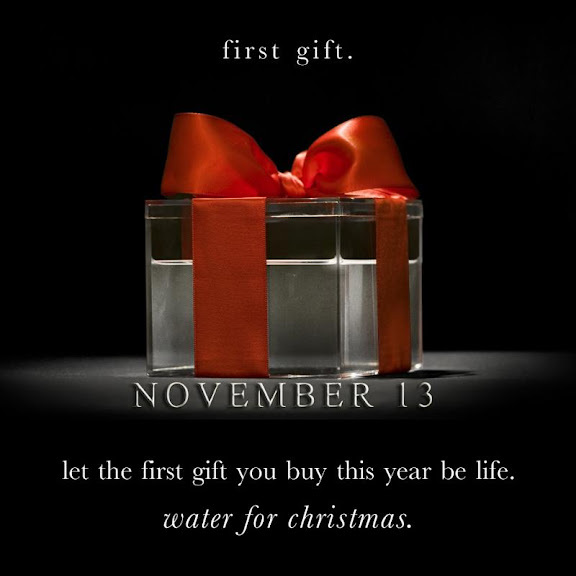 WOW, this is awesome..... here those of us who have so much are asking for all this material stuff for Christmas, when there's others out there begging for just some clean water for Christmas. WOW! This is a good idea. We've been supportin the Ronald McDonald House and Childrens Hospital LA this past year since they took such good care of us when Nate was there. But, I will also donate to this cause. It's a great idea. I don't want any other mommy to ever feel this pain. If I can save it from one, I will!!! i will be posting this as well!! thanks for the reminder! Jess, truly, you are amazing, and so inspiring! I am always awed at the miracles that God brings about because of you! Mothers all over Africa will be grateful to you for spreading the word. Thanks for letting us all know about this very worthy cause this year. What a simple way to give an incredible gift! You are just amazing! What an amazing cause, and so simple. Thank you for bringing this to our attention. I too have now donated, and posted to my fb page. I'm in!! Do you ever read Jody's blog (www.jodyrlanders.com)? She's amazing! Such an inspiration! Thanks for blogging about this. I'm off to donate now...Thank you, Jess. I've linked this to my Facebook page in hopes that others will contribute too. What a beautiful idea. I have been wanting to do somethign different with my own children this year to restore Christmas' true meaning... this is a good first start. Thank you. I pray God's "comfort and joy" are thick for you this holiday season. This is awesome! I just donated $50. Thanks for sharing! You are amazing..thinking of others in your time of grief...I too will join this awesome cause. What a wonderful idea. I'm going there right now to donate. Blessings to you! amazing! thanks you for sharing this. i'm going to share with others. Thanks for letting me know about this. I donated and will post it on my blog too. I did it! Thanks for presenting the opportunity! i think of your family often. was fun to meet Meg and others who love you dearly. Thanks so much for posting this! What a simple, yet amazing cause. I will definetly be giving to it and will be posting this link too! Done. Thank you for making me feel good about something meaningful this holiday season. I am sick of worrying about "what toys?" for the kids.... so meaningless. I am going to post this on my blog as well. Thanks for thinking of this, Jess. when i first heard about this from megan, i immediately passed it on. such a wonderful way to give. i had the opportunity today to venture out of my house all by myself and heard a song on k-love that really hit me. as i sat at the stop light, tearing up, i thought of you. the song is the first on my playlist on my blog, and the words are written down on the blog post 'Your Hands'. it's a very simple, but powerful song and i wanted to share it with you. Thank you for raising awareness. I donated this morning and then while cleaning my 6 year old daughter's room with her I was telling her about it and she decided she wanted to donate $10 from her allowance. When we told her dad what she wanted to do, he said he would match her donation so we gave $30 today and I am amazed by my daughter's giving spirit. She inspired me today. She wanted me to say that she donated money and she only has $1 left of her allowance but she is proud of what she did. Thanks again!! Donated and posting to my FB. What a great idea! I admire your Christ-centered ideas and blogs. You are such an inspiration...I think about you all quite often, especially now with Christmas coming up. Just know that I will be praying for you. Thank you for sharing this!! $10 is practically nothing to us and so much to those mothers! I donated and will encourage my friends to do the same!! OK, I'm reading back here, so forgive me! As a South African, I can only say thanks for posting this and for all the money you helped to raise! What a fantastic cause to support. Living in Africa and having travelled around a little, I can honestly say that we (that's all of us who live in cities around the world, who have private bathrooms with fresh running water and electricity and beds and fridges with food in them) have no idea how rough it gets out there. It breaks my heart to see young children begging for money at the traffic lights, plastic bottle of glue in hand, drunken parents sitting on the pavement. We have squatter camps and shantie (or informal) villages popping up all over the show. Living conditions in these villages are shocking to say the least. And South Africa is ahead of the game over many other African countries.